Bombarded with more Swiss chard in my Farm Fresh to You delivery package, I’ve been experimenting with some tasty and unique ways to prepare it. 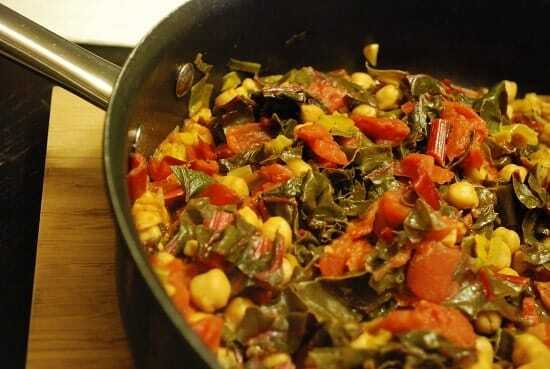 This Swiss Chard Recipe with Garbanzo Beans turned out amazing! My husband and I gobbled it up. The garbanzo beans add a lot of fiber and protein, so even though this is a technically a side dish recipe, it’s really filling at 4 Points per serving. This weekend, I actually doubled the serving size and ate it as a whole meal, instead of a measly frozen Weight Watchers meal I had set aside in the freezer. Much better. :) It’s a very easy Swiss Chard recipe that works well with a variety of main entrees too, and it truly is delicious. The different flavors and textures work so well together, and I love all the nutrients! So if you are looking for a unique and delicious way to prepare your Swiss chard, give this dish a try. What a deliciously unique way to prepare Swiss chard! This healthy side dish recipe is loaded with flavor and nutrients for just 4 Points per serving. Spray a large skillet with non-fat cooking spray and set over medium high heat. Stir in leeks and garlic; cook and stir for 3 to 5 minutes, or until soft and fragrant. Stir in broth and garbanzo beans, and season with salt and pepper; heat through. Place chard in pan, and cook until wilted. Add diced tomatoes, squeeze lemon juice over greens, and heat through. Plate and season with salt and pepper to taste. Sub out the chicken broth with vegetable broth, and this dish becomes a fantastic Vegetarian Recipe or Vegan Recipe. This was delish! I used an onion instead of leeks. Thanks! MMMMMMMMMMM! This looks scrumptious. Thanks for the post. what size can do you use of the diced tomato? Oops…I guess that info would be helpful..lol. Sorry! It’s the large, 26oz can. Thanks for pointing that out!